For the hot days on the job, work shorts are a must-have. Whether you want lightweight shorts or shorts of a thicker material, MASCOT has the right product for you. Shorts are of course relevant for the ones who work outdoors on hot summer days. 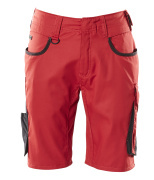 But work shorts can also be an indispensable investment if you work in environments with high temperatures, e.g. within industry, production or storage. With a pair of work shorts from MASCOT, you do not have to compromise on the many features you know from your long work trousers. In the assortment, you will find work shorts with many pockets and features so you still have room for your tools, mobile phone, keys and other things that you carry with you. The back pockets and ruler pocket in the shorts are additionally reinforced – for example with CORDURA® and Kevlar® – so the service life is extended. If you need extra space, you will also find work shorts with holster pockets. 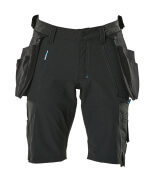 A series of shorts are even available with removable holster pockets, which can be zipped off when the pockets have to be emptied or the trousers need to be washed. When it comes to the material, MASCOT offers many options. No matter if you want stretch panels, 100% stretch or work shorts of a sturdy material, you will find it here. If you select shorts of an elastic material, you will get a unique freedom of movement that gives you superb comfort throughout the day. If you like traditional work shorts better, you will find a large selection of shorts of both twill and canvas, each of which is designed with special qualities in mind: Canvas is lightweight and sturdy, the soft twill of 100% cotton is extremely pleasant and the sturdy twill is highly durable. All of the materials keep its shape and colour even after repeated washing. 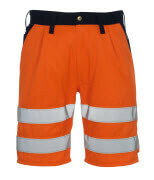 If you are looking for work shorts to use within industry, MASCOT also carries a selection of shorts that are approved in accordance with EN ISO 15797 – products that withstand industrial washing and drying.